Back to A Year of Trump index page. Of the countless political lessons to draw from Donald Trump's first year in office, this simple takeaway may be one of the most significant. 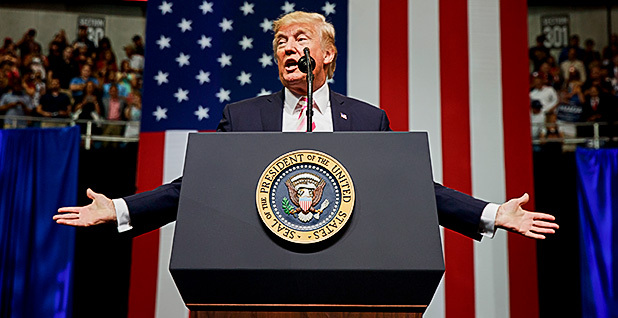 The president, while having angered those on the left as well as establishment Republicans, has also proved a boon to the coffers and organizations of left-leaning special interest groups. President Trump was elected a year ago. What does his term so far say about the next three years? Advocacy organizations report massive fundraising hauls, while the Democratic Party has an unprecedented number of candidates seeking office. "The sheer depth and breadth of attacks on the environment by this administration has been breathtaking to the public," said Tiernan Sittenfeld, League of Conservation Voters Action Fund senior vice president of government affairs. "People's interest in engaging is higher than it's ever been." EMILY's List, a group that backs Democratic female political candidates who support abortion rights, reports never-before-seen interest in public office, while newcomers such as Swing Left are spending millions of dollars to flip red seats. This interest manifests in increased donations to advocacy and issue groups, something the Democratic Party itself has not seen. Trump set off a parallel fundraising flurry in the first nine months of 2017, McClatchy reported. The Republican Party broke $100 million in donations by the end of September, a first. People's interest in engaging is higher than it's ever been. The Democrats, meanwhile, have struggled, and just last month the Democratic National Committee fired its finance director after the GOP doubled the DNC fundraising take from January to September. While their war chest may be low, Democrats appear revitalized after a rough 2016 campaign. The party has about four times the number of House candidates it had at this point in the past two election cycles, according to an October Politico analysis of federal election data. A blue House, once a pipe dream, is now possible, if not likely, next year. Dave Wasserman, House editor for the nonpartisan Cook Political Report, went so far as to call Election Day 2017 a precursor for 2018. "You can't really look at tonight's results and conclude that Democrats are anything other than the current favorites to pick up the U.S. House in 2018," he tweeted on Nov. 7. Climate and environmental concerns barely moved the dial during the 2016 election, but Trump pulling the U.S. from the Paris climate deal, Scott Pruitt's regulatory cuts at U.S. EPA and a summer packed with natural disasters have boosted green issues in national political discussions. This has been a record fundraising year for the national LCV, according to Sittenfeld, who noted a 40 percent boost in grass-roots contributions. LCV's fundraising initiative, GiveGreen, has raised nearly $6.4 million this year — more than double the total at this point in the last midterm election cycle. Tracking the larger trend, Sittenfeld notes a rise in candidates who cite environmental and climate concerns as central to their campaigns. The national LCV has met with nearly 130 potential candidates in 2017 alone, she said, more than in the entire 2016 campaign. One new science-focused group, 314 Action, exemplifies Trump's effect on green groups. Founded in summer 2016 to elect scientists and other science, technology, engineering and math professionals to public office, the organization has seen enormous growth since the president took office. Since candidate training began in January, more than 7,000 people who wish to see their name on the ballot have contacted the group. 314 Action is active in federal, state and local elections across the country and plans to spend between $5 million and $7 million in this election cycle. This growth is unthinkable without Trump in the White House, said group founder Shaughnessy Naughton. "We have far exceeded our goals as far as outreach in scientific communities in getting involved," she said. Take Hans Keirstead, Democratic candidate in California's 48th District. A neuroscientist and well-known stem cell researcher, Keirstead has spent most of his professional career in the lab, not on the campaign trail. He developed a cutting-edge treatment for spinal cord injuries that restores hand and arm movement in paralyzed patients. Trump's win changed things, he said. "The Trump administration has attacked the institutions of science, medicine and health care in a systematic matter," he said. "It's very motivating as a career scientist and a career biotech CEO." Keirstead would not have run had Hillary Clinton won the presidency — assuming, he said, the Democrat would not have appointed Pruitt head of EPA. "I felt compelled to step up and do something," he said. The neuroscientist is now a central figure in a House race that could decide the chamber's majority party. Rep. Dana Rohrabacher (R) has gone decades without a close race, but Trump's election has made the longtime incumbent vulnerable, and Keirstead is one of seven Democrats in the crowded primary. The Cook Political Report changed its race rating from "lean Republican" to "toss-up" this fall. Organizing is necessary and dollars are nice, but winning elections is the ultimate political currency. For all the anger at Trump, it took 10 months after he took office for the Democrats' first major electoral achievement. But the wait was worth it. Democrats cleaned up in the Virginia elections in November, taking the gubernatorial race — 2017's premier political contest — as well as the attorney general and lieutenant governor races and coming within a few seats of taking the state Assembly. I felt compelled to step up and do something. It was an unalloyed victory, a boost to national party momentum going into 2018 and widely seen as a rebuttal of Trump and Trump-style politics. Republican gubernatorial candidate Ed Gillespie hit many of the same notes as Trump during the campaign, and Democrat Ralph Northam won handily. It was also a massive victory for greens. Environmental issues may not have won Northam the race, but there's a strong argument an environmental group played a key role. After the Democratic Governors Association, no single group spent more money backing Northam than the Virginia LCV. It saw the race as a must-win, according to the group's director, Michael Town. Northam's policies — opposition to offshore drilling, joining the coalition of states honoring the Paris climate deal and a cap-and-trade program — made keeping the governor's mansion blue in a key state a top priority, he said. LCV Virginia wanted to stress the policy consequences on climate between the two candidates. Trump made this job easier. Ad after ad, both from the Northam campaign and from LCV, framed Northam in opposition to the regulation cuts enacted by Trump's EPA. "Suburban Virginia voters do not like the president of the United States," Town said. "They don't like his rhetoric, they don't like his policies, and I think our issues play well with that. The public wants solutions to climate change, not someone who denies it." LCV Virginia also coordinated outreach efforts with a cross-section of progressive advocacy groups, including NextGen America, Planned Parenthood, BlackPAC, Priorities USA and the National Democratic Redistricting Committee. This tracks a national trend among Democratic-aligned organizations. "We are working more closely than ever before with our allies across the progressive movement," Sittenfeld said. Virginia was a significant win for Democrats, and Town expects advocacy groups across the nation to look to the campaign as a model for midterm efforts. And while using Trump as campaign contrast is perhaps an obvious strategy, it also proved an effective one — at least in the Old Dominion. "I've never seen an election where one person was so polarizing," Town said. That contrast swings both ways. "There could not be a more stark contrast between President Obama's leadership on climate and public lands," Sittenfeld said. She meant that as a condemnation, but for GOP voters, particularly in the West, this is high praise. They see Trump as in their corner, according to Brock Lowrance, a GOP strategist who has worked extensively on Western campaigns. Rolling back the Clean Power Plan, increasing state and local input on logging and mining, and encouraging oil and gas development on public lands: Western and rural voters can point to tangible Trump efforts to enact policies they support, Lowrance said. "The policies that come out of [the Agriculture Department], Interior and some of these other subagencies affect people's lives in rural areas," Lowrance said. "They are attuned to this stuff." Under Trump and Interior Secretary Ryan Zinke, the administration has streamlined oil and gas permitting processes, lifted a coal mine permitting moratorium and enacted a number of other rules encouraging the president's "energy independence" executive order. "Less federal government control has always been at the forefront in the West," said Lowrance, who grew up in a small town in western Montana. "It's like in the Obama administration, these regulations came from the top down, and people looked at it as the elites saying, 'We know better than you do when it comes to what's good for you people in the sticks.'" From this view, Trump makes a favorable contrast against Obama. The 44th president was seen as an out-of-touch liberal who strangled natural resource development via executive fiat, ignoring the local communities dependent on these industries. Trump ensured public lands will be electoral flashpoints next year, after signing an executive order that reverses federal protection for more than 2 million acres of Utah land. "Some people think that the natural resources of Utah should be controlled by a small handful of very distant bureaucrats located in Washington, and guess what, they're wrong," Trump said yesterday (see related story). A state-by-state nationwide September poll from Morning Consult showed Trump with an across-the-board rating decline since his inauguration but with generally positive approval margins in Western states. The burden, then, is on Western Democrats such as 2018 GOP target Montana Sen. Jon Tester (D) to justify opposition to Trump and support for any of Obama's environmental regulations or public land use restrictions. "How are Democrats going to explain to some of these rural communities that they're going to fight President Trump on some of these policies where they don't like what the federal government has been doing for years?" Lowrance asked. This is a problem for Democrats, who face a historic deficit in governorships and state and local offices. At the beginning of Obama's term, Democrats controlled 59 percent of state legislatures, while now they control 31 percent, the lowest percentage for the party since the start of the 20th century, according to FiveThirtyEight. Not all share Lowrance's view. Jerry Johnson, a political science professor at Montana State University, said Western voters, even conservative ones, cherish access to public lands. There's broad opposition, he said, to many of the policies coming out of the Interior Department. "This attack on public lands is not going over well out here," Johnson said. "I think it's interesting that [Republicans] think they can just play the Trump card and get away with this public lands stuff." He noted that some traditionally conservative groups including sportsmen organizations and business associations oppose Zinke's efforts. "National monuments protect land and historic features for future generations and also contribute to their states today," Marne Hayes, executive director of Business for Montana's Outdoors, wrote in an August op-ed in the Billings Gazette. The group has organized Western business leaders against national monument repeal. Converting outdoor angst into electoral success requires the right kind of Democratic candidate, though. Johnson pointed to Tester, calling him a "very traditional Western Democrat." A flat-topped farmer from the Montana plains, Tester has developed a state-specific stance separate from the national party — a crucial move, according to both Johnson and Lowrance. Democrats seen as overly wedded to the DNC fare badly, as Lowrance knows firsthand. This spring, he ran Rep. Greg Gianforte's (R) campaign in the special election for Montana's at-large congressional seat against Democrat Rob Quist, a staunch member of the party's left flank. Lowrance called Quist "Bernie Sanders in a cowboy hat"; Johnson described him as "a terrible candidate." Quist received endorsements from major environmental groups and millions of dollars in donations from the national party. Party excitement for his campaign was considered part of the anti-Trump opposition, but the blue wave turned an anchor in this case. He was unable to capitalize on Gianforte's attack of a reporter one day before the election and lost handily. It was an easy step for Gianforte to align with Trump and Zinke — both speak of decentralizing Interior rulemaking to emphasize local concerns — while framing Quist as an interloper. "The Democrats have to make the case that they didn't leave the rural Western communities behind without angering their coastal donors and environmental groups, who have a different take on what folks in small-town rural Montana should think," Lowrance said. "They have to thread that needle."